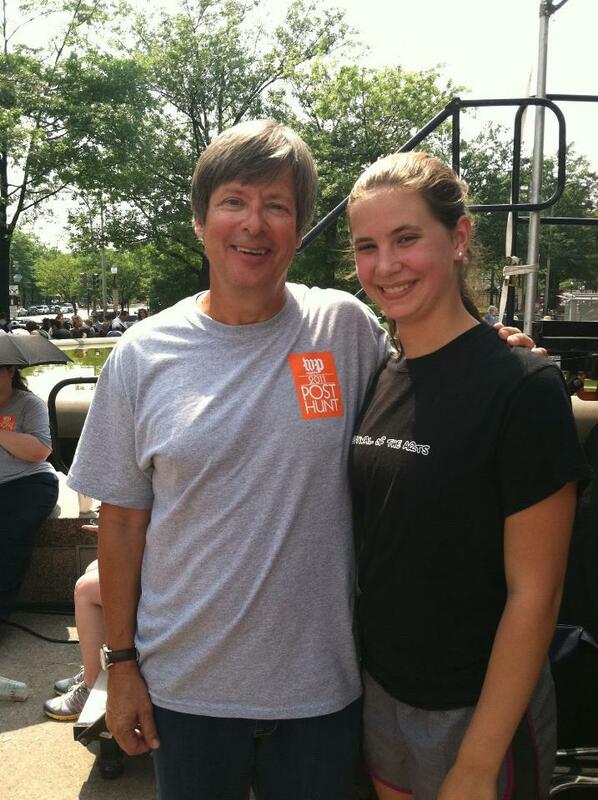 Junior Claire LaPlante, a guest blogger, ventured into downtown D.C. with ten thousand other puzzle solvers for the annual Post Hunt June 5. The Hunt, sponsored by the Washington Post Magazine, challenges participants to solve five puzzles and a final game to earn the title of “Post Hunt Champ” and $2,000 dollars. Although she didn’t win, LaPlante shares her experience at her fourth Post Hunt below. If you’re interested in guest blogging as well, please email theblackandwhiteonline@gmail.com with your blog idea. Junior Claire LaPlante meets Dave Barry, one of the co-founders of the Post Hunt, along with Gene Weingarten and Tom Shroeder. In their fourth trip to the Hunt, LaPlante's team managed to crack three of the five puzzles. Photo courtesy Claire LaPlante. Every year since 2008, a couple thousand Washingtonians flock to Freedom Plaza in downtown D.C. to try their hand at Post Hunt, a scavenger hunt founded by Washington Post writers Gene Weingarten, Tom Schroder and the hilarious Dave Barry. I am proud to say that for the last four years, I have been in that growing crowd of locals (and obscenely competitive people from Florida) trying to win the $2,000 dollar cash prize and the coveted title of “Post Hunt Champ.” I compete in a team with my mom, along with junior Claire Pollak and her mom. I approached this year’s Hunt like I always have, by searching the Washington Post Magazine for anything out of the ordinary. The Magazine sponsors the Hunt, so usually, an altered article or advertisement leads to an answer. In the past, insightful Hunters have found answers in crossword puzzles, the “Second Glance” and other regular features of the Magazine. A few things struck me as interesting, including an ad for the Washington Post advertisement division that seemed fake. Upon calling the poor person sponsoring, I discovered the ad was very much real. There wasn’t anything blaring, but I thought I might as well be familiar with the Magazine. Then, I showed up to Freedom Plaza like everyone else. The puzzle makers warned us that this year’s Hunt would be particularly hard, and it undoubtedly lived up to that expectation. One clue required tearing out a small piece of the magazine to reveal something hidden behind it. Not exactly a task I had prepared for. Since the group of guys who design the Hunt have pretty good senses of humor, they tend to put together an amusing Hunt. One challenge handed out sheets of scratch off’s that had seemingly random numbvers. On the top, it said, “Scratch ONLY where needed.” First, my group scratched off “ONLY” and added up the numbers. But after looking at the scratch off for a while, we saw that the “random” letters spelled at “ITCH.” We scratched the “ITCH” and got our answer. After attempting to solve the five challenges, everyone returns to the Plaza for the “end game,” which can only be solved if the other five answers were correctly found. This year, a Beatles cover band appeared on stage, and Dave Barry announced that “each Beatle has a song for you, but only one matters. Since we only solved three of the five puzzles, we didn’t have enough information to even attempt the endgame, but we listened anyway. Each Beatle played part of a song that featured a number. We had no clue which one to listen to, but those who did combined the answers to the five other puzzles to give an image of an outhouse, using a grid provided by the Hunt. Then, it was clear: John (slang for bathroom) was the Beatle to listen to. That key piece of information led the hard-core Hunters all over the city, ultimately leading them to drop a ping pong ball with their phone number on it into a large black box on the Ellipse. Needless to say, we didn’t quite make it that far, but we weren’t alone: only five teams solved the end game, out of ten thousand people. We’ve seen a wide range of puzzles, but these were by far the hardest of all. But we’ll come back with an even stronger determination in year five. Our biggest hope is that the puzzlemakers add a home court advantage next year: locals rarely win.